connected with Children’s Advocates at Solid Ground’s Broadview Shelter to bring library books, activities, programs and services to Broadview families. Librarians bring a variety of uncatalogued paperback books to Family Fun Nights held in Broadview’s playroom on the last Tuesday of each month. They can also sign kids and parents up for library cards on the spot, provide kids with book suggestions, and clear any fines that prevent families from accessing library services. Kids and their families are encouraged to borrow as many books as they like without due dates or library cards necessary. Thanks to Friends of the Library, additional books are donated to Broadview. 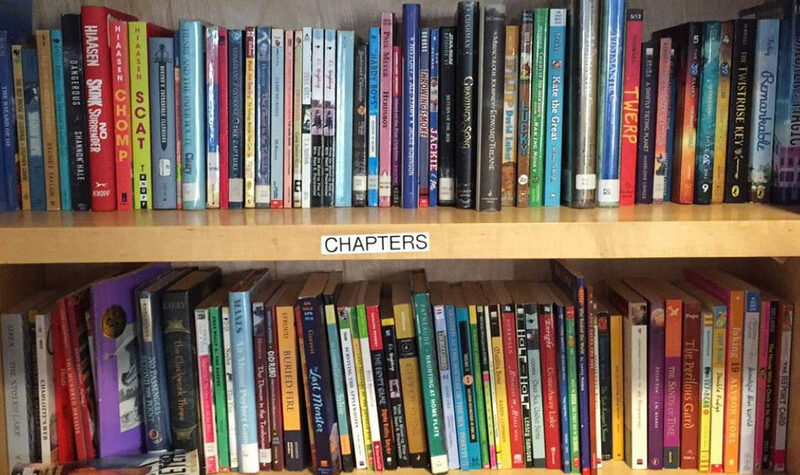 These books are stored in Broadview’s onsite library and are suitable for the whole family – ranging from picture books, teen and adult books, and graphic novels. The Broadview’s Children’s Program has hosted Family Fun Nights for over 10 years. This monthly event unifies families with their community and serves as a time for kids and families to come together to eat, read and socialize. Librarians have also participated in many activities with the kids and their families in the past, including “Milk and Cookies” story times, and simple art projects for different age groups, such as making bookmarks. Bringing library services to the shelter prevents parents from having to make extra time and effort to take their kids to the Library. Librarians stimulate reading and help kids generate new ideas while keeping reading fun and accessible for kids and their families. The Library’s 2018 Summer of Learning Program is also set to launch in a few months, allowing kids to choose from a selection of books that they can keep, and providing activities that support their reading throughout the summer. Not only does this program provide kids with free access to books of their choice, but it also works around the kids’ interests and reinforces their academic progress. In the summer, Librarians bring the program to Broadview so families they serve can participate as well. According to Broadview Children’s Advocate Joanna Tarr, this is a “positive partnership” that brings new books and opportunities to kids and their families. She shares that kids are always excited to bring their piles of books home. The Children’s Advocates of Broadview’s Children’s Program truly appreciate the library staff for taking the time to visit Broadview and for bringing wonderful energy to the Family Fun Nights. Is this Lauren Mayer that was at Oxford University in the summer of 1988? If so, and you remember me, send me an email. It would be hilarious to re-connect with you. Hi David, you might try contacting Lauren through the Seattle Public Library as her contact info is not connected with this post.